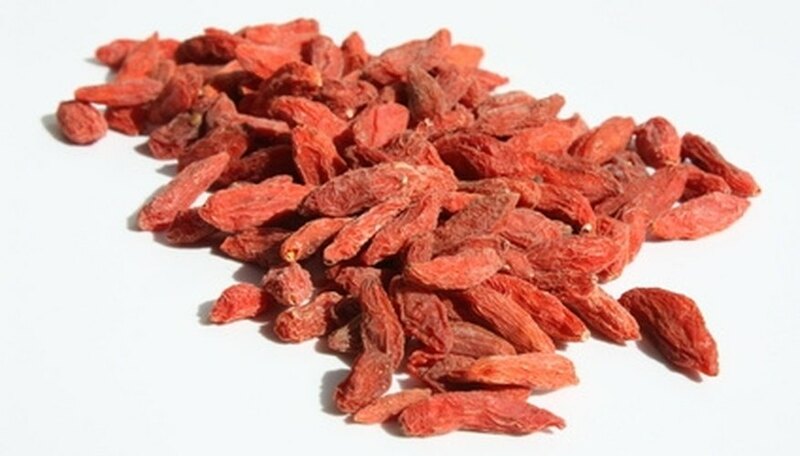 Goji berry is the commercial name for a plant that is horticulturally known as wolf berry (Lycium barbarum), a member of the nightshade family. Goji berries grow on a deciduous shrub that reaches 8 feet in height with a 13-foot spread and blooms from June to Augus. Goji berries have a slight liquorice flavor when ripe, which is the only time they should be eaten, cautions Plants for a Future. Goji berry plants are easy to propagate from both seed and cuttings. Take your cuttings in July or August. Cut a piece of goji berry branch from the current year's growth, pulling it outward and then sharply down, taking some of the older bark with it. This is known as a "heel cutting." Trim the branch to 6 inches long. It should have at least two leaves at the tip. Combine equal parts of sphagnum peat moss and vermiculite in a large nursery pot and add water, stirring, until the mixture is completely wet. Allow it to drain completely. Scoop the soil into a smaller planting pot and use a pencil to poke a 2-inch-deep hole in the planting medium. Remove all leaves from the cutting with the exception of two at the tip. Dip the heeled end of the cutting into rooting hormone and then place it in the prepared hole in the planting medium. Pack the soil around the goji cutting. Mist with water from a plant misting bottle. Place craft sticks into the soil, evenly spaced, around the edges of the pot. They should extend higher than the cutting. Place a plastic bag over the pot, adjusting the plastic so that the craft sticks hold it away from the cutting. Make two or three small slits in the bag to allow air to circulate. Set the bagged cutting in an area that receives light, but not direct sun, and remains between 65 and 75 degrees Fahrenheit. Check the planting medium daily. If it begins to dry out, mist lightly with water. You will know that your cutting has rooted when a light tug on it meets with resistance. Remove it from the bag at that time. Plants For A Future: Lycium barbarum - L.